The HP 8657B Signal Generator with Option 022 GMSK Modulation, is fitted with the 0.3 GMSK Modulator Unit underneath the Signal Generator. The original cost in 1993 of Option 022 was $7,345. HP Technical Data describes Option 022 "For European digital communications systems, generates 0.3 Gaussian Minimum Shift Keying (0.3 GMSK). 100kHz to 2060MHz AM & FM. 0.3 GMSK 520MHz to 2060MHz, 10MHz to 130MHz data inverted. Baseband I/Q outputs. With 0.3 GMSK modulation turned off, the Signal Generator performs as a standard 8657B". The 8657B is modified to provide a 800MHz input and output to the separate 0.3 GMSK Modulator which is housed in a 1U high case underneath. Interconnections are provided by 2 SMA to 3.5mm cables. 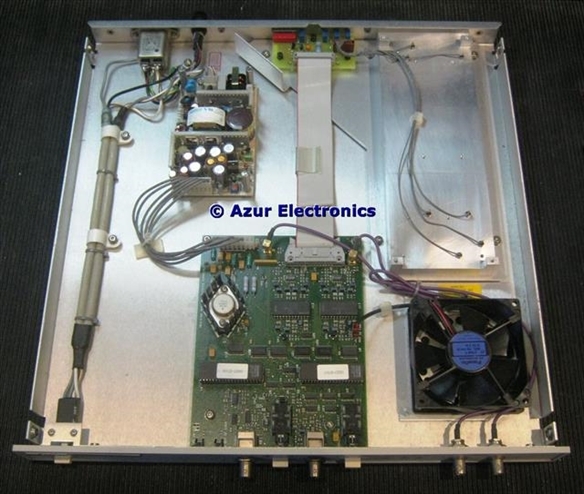 The 3U high 8657B is fixed to the Modulator with 4U high front panel handles and rack ears, plus special brackets at the rear. The Modulator had a reported fault "Smoking! ", this turned out to be a minor problem, see Repair HP 8657B Signal Generator. The Computer Products NFS40-7610 SMPS has been tested ok. I don't have the facilities to test the Modulator although it powers up ok.
As I have no need for the 0.3 GMSK Modulator unit, this is FOR SALE.